Rajasthan has always been my dream destination. Far-stretched desert, the magnificent palaces, the marvellous forts, the vibrating culture and exciting camel safaris just enthrall me. I always thought to visit the land and fortunately, a trip to Osian came to my pocket, when my sister told me about her weekend plan of Travel to Jodhpur. I left with Nikita, my younger sister for Osian, which is situated around 65 Km from Jodhpur in Rajasthan. From Delhi, we hired a private cab to reach Osian. Living in a metro city like Delhi, at times makes you feel bore with its hustle and bustle of everyday. We stayed in a camp resort, which was loaded with modern amenities. The delicious food that we enjoyed there was one of its kind experience. We had traditional Rajasthani food including Dal Bati, Gatte ki Sabji and sweets. My visit to Osian just took us back in time. The royalty of the time was just drawing our attention. 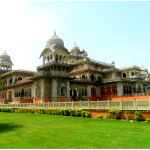 The place is also known as a religious centre in Marwar. There we could see the beautiful cluster of ancient Jain temples. Having heard a lot about the temples of Osian, I could not help myself from visiting there. With Nikita, I headed to the Jain Temples which boasts of famous Sun temple. Built in 10th century, the temple is noteworthy for being the oldest one. Surya (Lord Sun) is worshipped by the Vaishnavites, who ruled there. The temple holds great religious significance and attracts the tourists due to its historical and architectural value. As we moved ahead in the temple, we found a beautifully carved doorway which was simply awe-striking. 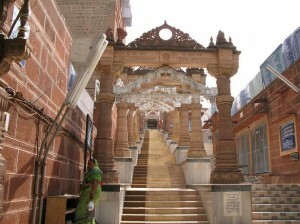 Kali temple is another attraction of Rajasthan, which we visited after the Sun Temple. The architectural beauty of the temple just left us mesmerized. Then, we moved towards Sachiya Mata Temple, which was built in the 8thcentury. Dedicated to Sachi Mata (Consort of Lord Indra(Rain God)), this temple complex had two other shrines, dedicated to Amba Mata and Chandi Devi. There was a series of beautifully sculptured arches, through which you can enter the temple. 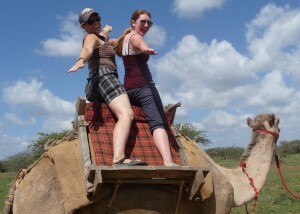 How could we miss out the most exciting ride-Camel Safari! This interesting ride in Osian took us to another world. We could even spot several peacocks, which was a unique view. Our Osian Tour was over and we were left us with a refreshing experience. 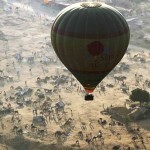 Recollecting the memories of our Rajasthan tour, we came back to Delhi.